By John Newton. Images the Pencil Museum. For more than 180 years the UK’s first pencil factory was set up in the Lake District town of Keswick – and it’s still thriving. It all started when graphite was discovered in the mid 1500s in the Borrowdale valley, 15 kilometres south east of Keswick. But it was many years before the graphite mineral was developed into a writing instrument and a cottage industry of pencil making was developed. This culminated in the establishment of the first pencil factory, which became the Cumberland Pencil Company in 1916. 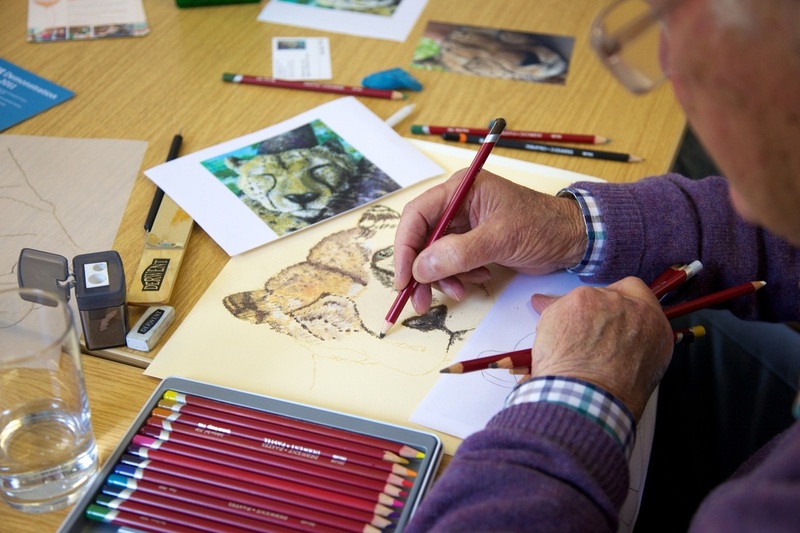 After the famous Derwent brand of fine art pencils was launched in 1938, a big variety of artists’ materials has been developed – from traditional to highly innovative. Today, the pencil factory, which was later extended to include a museum, is now based in Workington and is the only one of its kind in the UK, producing one million pencils a year which are exported to 72 countries worldwide. 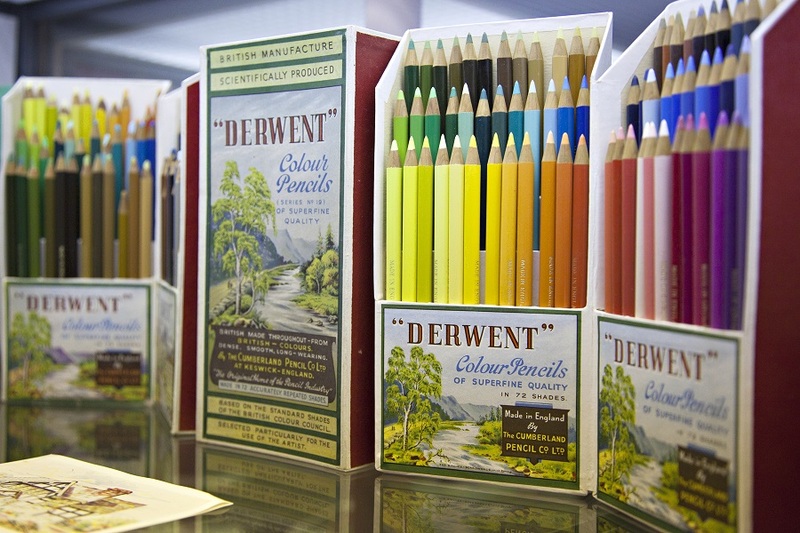 The Cumberland Pencil Museum- still in Keswick – tells the story of pencil making. It attracts more than 80,000 visitors a year, with most eager to see the world’s tallest pencil, which took 28 men to carry into the museum in 2001. The giant pencil is more than 26 feet long. Other major museum exhibits are a pencil worth between 2000-3000 pounds given to the Queen for her Diamond Jubilee in 2012 and the replica of a top secret, gadget pencil used by Lancaster Bomber airmen to escape Nazi Germany. The secret map and compass pencil was one of hundreds manufactured in secret by the pencil company. There are now thought to be just 10 of the pencils still in existence worldwide, with one on display at the museum and the other held by the UK Government. Containing a secret compartment for a tiny compass and one of three tightly rolled escape maps on specially produced tissue paper, the pencils were distributed to RAF pilots to help guide them home safely back through the Netherlands, Belgium and Switzerland, as well as being sent to prisoner of war camps. 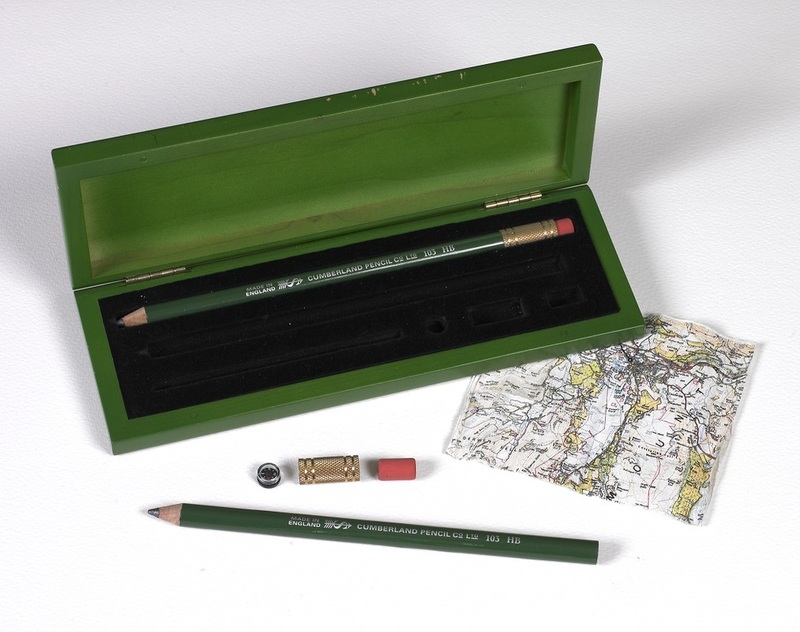 Derwent’s commemorative sets come in a wooden box, containing one complete pencil and includes all the original features of the 1940s escape kit. That includes a compass, pencil barrel, ferrule and eraser, alongside an OS map showing the Pencil Museum’s home in Keswick and the nearby mines at Seathwaite where graphite was first discovered in the 1500s. Did you know the phrase ‘black market’ comes from the act of smuggling graphite? But it marked a smuggler’s hands – so everyone knew what they’d been doing. Graphite miners were stripped and search when they came out of the mines, because graphite was so valuable it was worth more than gold. If convicted of stealing graphite, miners were sentenced to seven years’ hard labour in Australia.